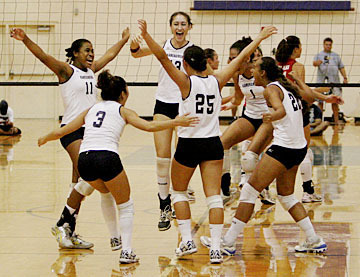 Kamehameha celebrated its win over Iolani yesterday. The teams will play a one-match playoff tomorrow for the ILH title. Kanani Herring slammed down 13 kills to lead No. 2 Kamehameha to a three-game win over previously undefeated and top-ranked Iolani, 25-23, 25-27, 25-23 last night in an Interscholastic League of Honolulu girls volleyball match at Kekuhaupi'o gym. With the victory, the Warriors (16-1) earned the ILH's second-round title, forcing a one-match playoff with the No. 1 Raiders (16-1) to determine the overall ILH champion. The match, which determines the league's top seed in the state tournament, is scheduled for 4:30 p.m. tomorrow at Iolani. In the deciding Game 3, the Warriors found themselves down 20-16 before mounting a three-point rally to tighten the match. A service ace by Kristal Tsukano tied the game at 21-21. The Warriors then took the lead with a push off the block by Bekah Torres. "After you get one kill, the confidence just builds up, and you keep going from there," said Torres, who put down six kills in the final game, finishing with 10 and an ace for the match. "We felt like we wanted this game more than anybody. Being second is not what we want. We want to come out first." At 22-21, the teams traded points before Torres' powerful kill from the right side gave the Warriors match point. The match ended when Iolani's Lauren Minkel hit wide. "It was just perseverance, everybody wanted (the win)," Herring said. "The team that wants it the most will come out triumphant. Iolani was the best team we could have played. We need to dig deep in order to win this game." Alexis Robins got eight kills while Tehane Kahalehau added six. The Raiders were led by Leilani Keanini with 11 kills. Megan Burton added 10 kills and five blocks from the middle, while Minkel finished with nine kills. "The girls did a good job of bearing down at the end," Kamehameha coach Chris Blake said. "We got a little lucky at the end, and got the Game 3 win." As the Warriors celebrated, the Raiders left the gym with the knowledge they had not played their best, yet still forced the match into a close three games. "I think we played a really poor match today," Iolani coach Luis Ramirez said. "On the bright side, as poorly as we played, the match was really close ...The way we played today, we should have lost in two." The Raiders committed 17 hitting errors to go with 10 service errors. The Warriors began the match slowly, falling behind 4-0 due to the shaky passing of a barrage Kapua Kamana'o serves. Kamana'o picked up two aces in the run and ended the night with three. "A lot of it, of course, was any kind of jitters," Blake said. "We knew what it was for, and the girls put a lot of pressure on themselves. But once things settled down and we started to play our game, the girls really executed well." After tying the game at 5-5, the teams traded the lead several more times before the Warriors took control by slowly pulling away in the teens, getting a four-point lead as they reached 20. And although the Raiders scored four unanswered points to tie the game, the Warriors won with a thunderous Herring kill. Feeding off their momentum from Game 1, Kamehameha got off to a fast start in the second game, getting a three-point separation in the early going. But the Raiders took the lead at 13-12, when Herring tipped the ball into the net. From there, Minkel took over, tallying five kills, including a shot that gave the Raiders game point. Iolani took the game with a Burton solo block of Torres.